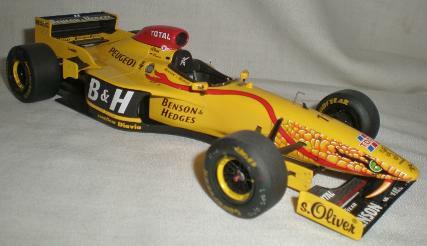 Jordan's 197 car was Designed by Gary Anderson who had been with Jordan F1 since their 1991 debut season. Peugeot's A14 72-degree V10 engine was mated to Jordan s own seven-speed longitudinal semi-automatic gearbox. 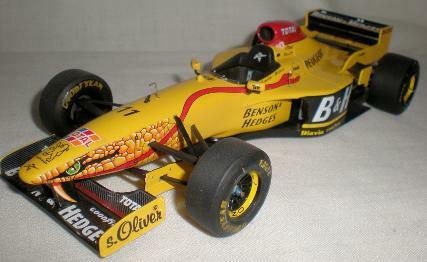 The car really stood out with its distinctive bright yellow livery and title sponsorship from Benson & Hedges. 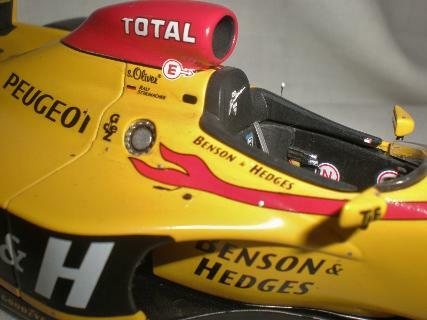 The cars also had a snake painted on the nose with a forked tongue that extended back around the sides of the driver's cockpit, This proved useful in countries were tobacco advertising was banned as the Team ran snake oriented themes, "Bitten & Hisses" or "Ssssschuey"/"Fisssssssi" instead of "Benson & Hedges". Eddie Jordan gambled on youth to replace experience recruiting two young, inexperienced drivers in Ralf Schumacher, a complete F1rookie, and Giancarlo Fisichella who had only raced part of a season with Minardi. 1996 had been a disappointing season for Jordan but the team appeared revitalised in 1997. The car was good and gave a real chance of seriously challenging the top teams of Williams, Ferrari, Benetton and McLaren. After a couple of races Schumacher and Fisichella were regular point scorers and took three podium finishes. Fisichella being particularly impressive scoring two of them. The team eventually finished fifth in the Constructors' Championship, with 33 points - the highest number of points in the team's history to that point. The Argentine Grand Prix was the third race of the 1997 season and saw Ralf qualify 6th with Fisichella 3 places back in 10th on the grid. Jacques Villeneuve took off from pole leaving the others scrambling in his wake. Michael Schumacher almost collided with Panis who moved off line to avoid an accident. going into the first corner Schumacher got alongside his team mate Eddie Irvine before crashing in front of Rubens Barrichello s Stewart. Carnage ensued and in the confusion David Coulthard ran in the back of Ralf's car, fortunately causing no real damage to the Jordan but ripping the front wheel off his McLaren. With the track blocked the safety car was called out and led the race for 4 laps. At the restart Villeneuve pulled away again and it was only in the final few laps that Eddie Irvine closed the gap to Villeneuve. On lap 24 the two Jordans collided causing Giancarlo Fisichella to retire from the race. Ralf Schumacher went on to finish third giving the team their first podium of the season. 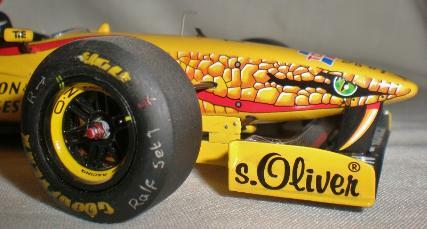 Revell released kit # 07212 at the end of 1997 along with that years Williams and McLaren cars. It was a very welcome addition given the lesser status of the team and a clear indication that the team was popular. 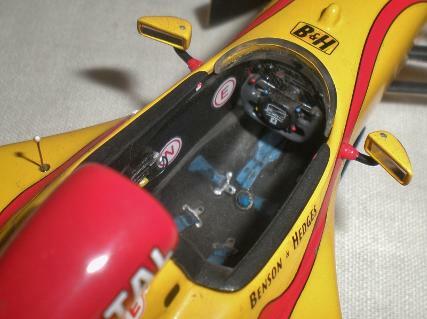 One point to remember when building Revell F1 kits is that they aren't accurate replicas at all. 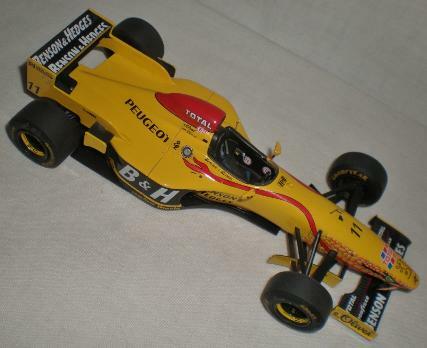 They represent the preseason test and development cars and often by the time the cars started racing they are different to the drawings and cars that Revell had been given access to. As F1 is highly secretive and always moving technologically it would be hard for the mass production of accurate kits to keep pace. The results of the kit are fine straight from the box but if the builder does some research and is prepared to do some modifications then these kits can usually be turned into very nice replicas. Either driver, Ralf Schumacher #11 or Giancarlo Fisichella #12, could be represented from the very nice decal sheet. Ian built this model in 1998 and it is more or less straight from the box. Ian always works on the area of the front suspension on the nose area where Revell have a habit of creating seams and gaps that are most unlike the real machines. The answer is to make the body first and fill all the gaps except the suspension mounting holes. These have a backing plate put inside to help support the modified front suspension. The suspension sub-assembly is built then the top wishbones have the centres cut out and are adjusted to fit into the holes with the location of the assembly from the bottom of the tub as in the instructions. 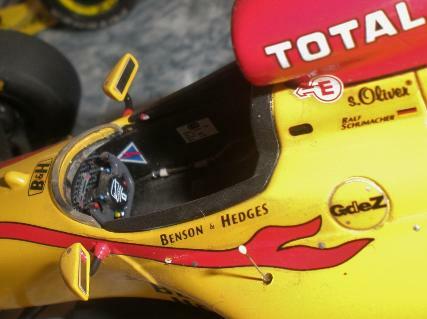 The aerials and pitot are made from wire and the body seams were covered with clear decal sheet to simulate the clear tape often used to smooth airflow over the joints in the bodywork of F1 cars. The car is painted with Halfords acrylic car spray paints the Body being "broom yellow" which seems to match rather well.Additional painting was done with Citadel acrylic paints from the games workshop range. 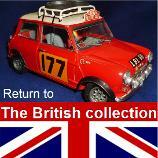 F1 was responding to the “no cigarette advertising” campaigns buy running cigarette ad's only in certain countries. This limited the kit producers to races with the tobacco advertising bans in place as the advertising ban became extended to include the display of said items and sales of anything that might be considered promotional. 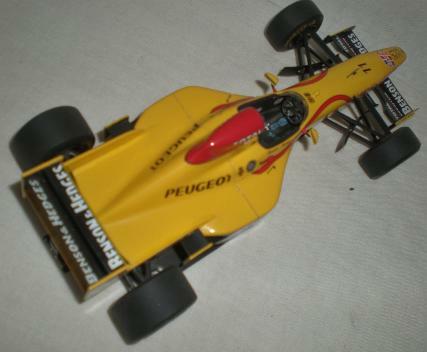 Of course after market suppliers quickly launched “Benson and Hedges” logos for the races which did allow cigarette advertising, like F1 Specialties product “#J97 Revell Jordan-Peugeot 197” which also has some of the other sponsors logos used at these other races. The argument for how much F1 cigarette advertising actually convinced people to smoke continues; although one is forced to laugh at the arrival of “Johnny Walker” Whisky advertising that appeared on the sides of McLaren's car the next season.... Surely we would all turn into drunk drivers if we watch F1 by the same power that convinced us all to smoke.